Here at Midlands Asbestos Solutions, we are committed to our development of health and safety. We like to see ourselves as an asbestos removal contractor who continuously strives to achieve the next level of success. In regards to both our asbestos removal, surveying or training work. And, obviously our health and safety. • Equal Opportunities and Diversity. We felt this was very important to us as a company because it shows our ongoing work behind the scenes to keep ahead of the game and ensures that we are not just working to minimum standards but trying to exceed the expectations of current guidance and legislation. We aim to use this as a platform to show ourselves as a company who are committed to continuous improvement while still providing the excellent service which has given us the reputation we have today both in the commercial and domestic sectors. 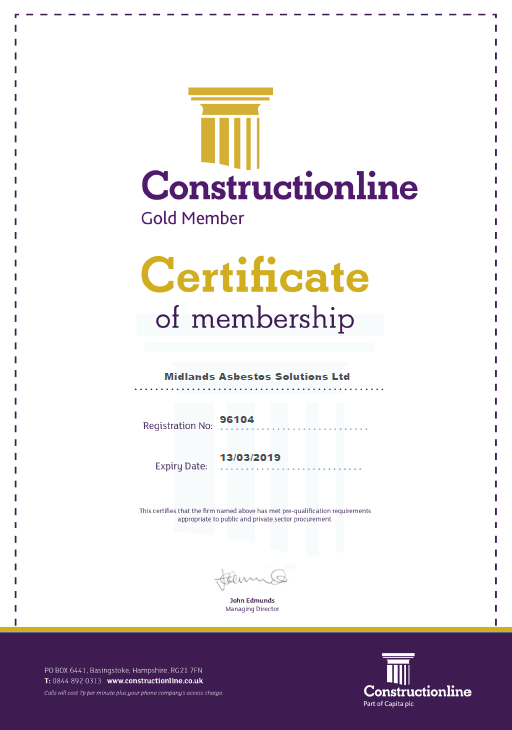 For more information about Constructiononline visit their site. See the rest of our accreditations here.